Ok, I don't mean your typical white ceiling paint here folks. I'm talking fun accents and colors. If you're wanting something different but not too much work, try a color other than white. It could be the same as your wall color or an accent color (maybe you couldn't decide what wall to do?). Just make sure you don't pick something dark if your walls are also dark. No one wants to live in a cave :) If you're looking for something a bit more fun, what about doing a pattern, design border or lighting accent? See below for ideas. Metal brings practically as many options as paint does, with potentially a little less work. There are so many options for finishes, size of tiles and patterns. And you can actually use the same pieces for accents too. For instance a backsplash or back panel of a bookshelf. Most ceiling products come in 2'x2' or 2'x4' panels and are easy enough to install yourself if you desire. 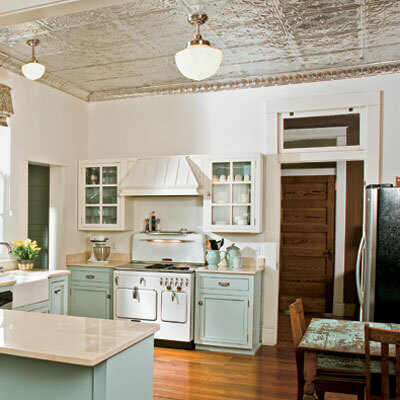 I am drooling over this kitchen pictured below from This Old House. 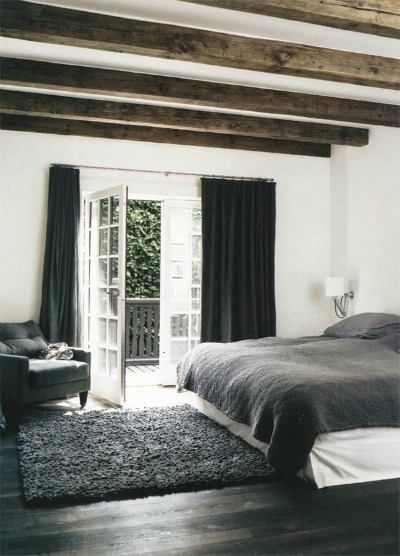 Gosh, I could look at pictures of spaces with beams all day long. They add so much character to a space. And you don't have to have super tall ceilings for them to look appropriate. Beams are an option that can be added to a space with minimal work and a little planning. Whether stained or painted, they catch your eye and carry it through the whole space. They work on vaulted ceilings, across large rooms and placed in grids. Whether it's light or dark, adding wood to your ceiling adds a rich, warm and custom feel to any space. I especially love the look in kitchens but it can go anywhere. 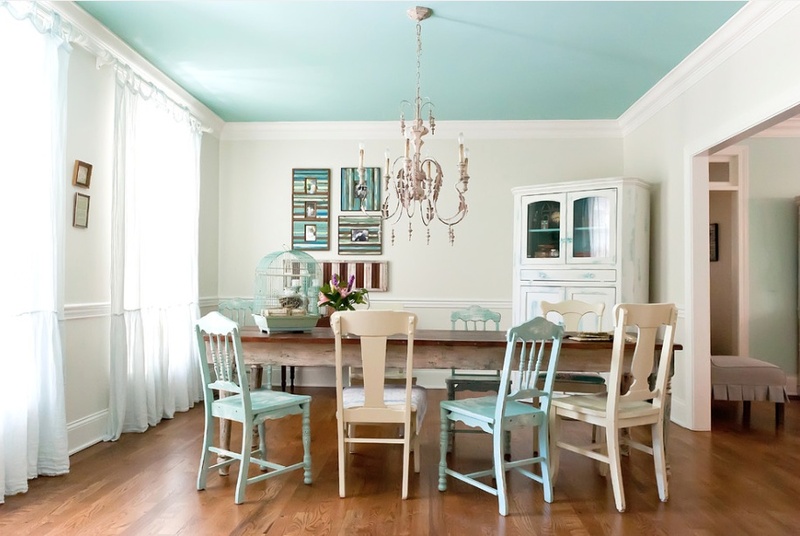 And remember those popcorn ceilings that are difficult to repair and add little visual appeal? Try covering it with wood planks! Wondering what I mean by Architectural Trim? 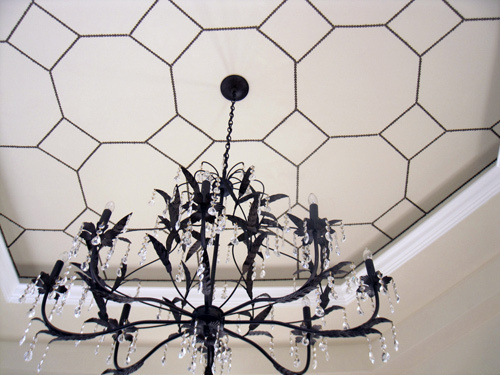 Think coffered ceilings or any added molding that creates dimension. The look definitely shows up more in period homes but there are a lot of ways to make it suitable to more modern designs. Plus, it can be fairly budget friendly and potentially a DIY project. Look how just a few pieces of simple molding add so much to this kitchen. You're probably confused. 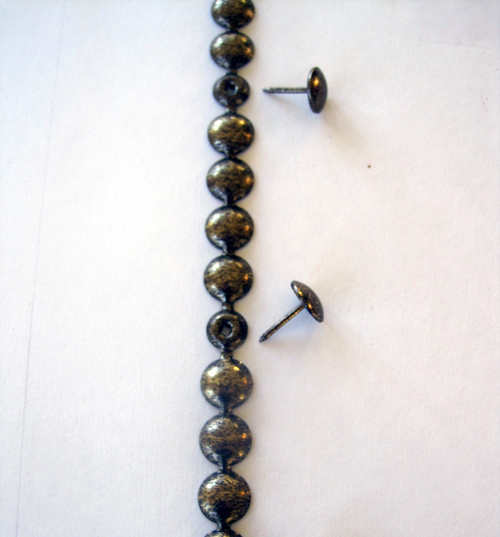 Think upholstery nails, not roofing nails. I would never have thought to do something like this, how creative! I recognize that this is a very unique style and a very labor intensive project, but I just wanted to show you that a little creativity goes a long way and her efforts definitely paid off! I can't wait to hear your thoughts on the 5th wall! Let me know if you've been inspired to try something new!